Over the years I have accumulated a near complete set of war diaries from the National Archives, covering the British Airborne Forces throughout the Second World War. 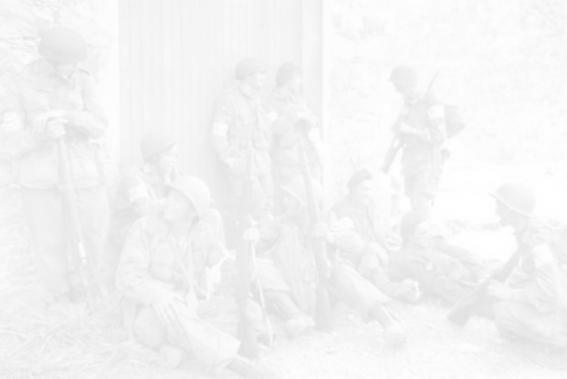 This is a superb reference library, providing a daily record of everything that a particular unit was doing, whether in action overseas or training at home. Elements of these have been published on the website to help describe the various airborne operations, but this represents a mere fraction of the entire collection, which due to its sheer size, currently in excess of 23,000 pages, is unlikely to ever be made available on the site in any form. 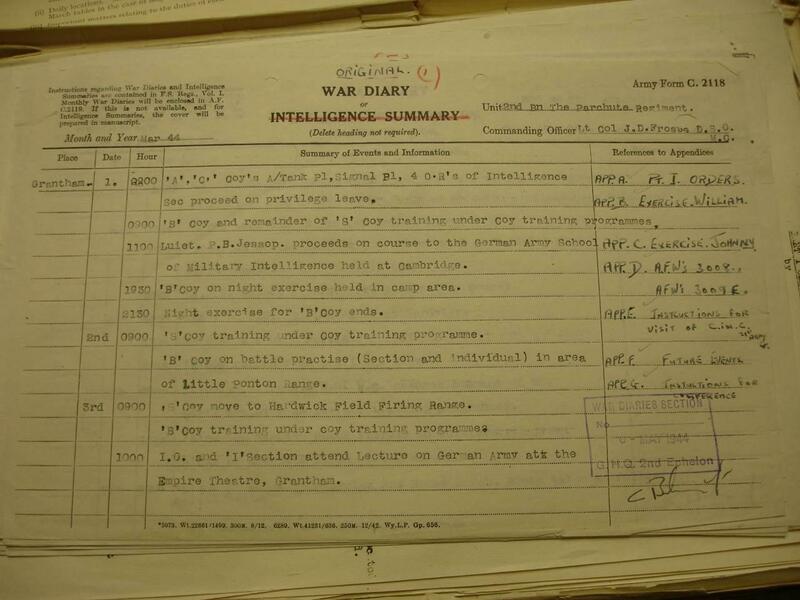 The war diaries are listed below, with the dates they span and the number of pages in brackets. The dates are believed to be a true indication of what is enclosed, but it is possible that a particular month was not included in the diary. If there is a specific date you are interested in, please get in touch so that I can check it is there. The diaries contain the daily record of events and, where available, operation orders, reports, sketches, and select examples of the weekly officers roll. The level of detail in each diary is entirely dependant upon the author; a month can be summarised with a single page, or a dozen sheets to describe one day. Each page is a jpeg photograph of 1280x960 resolution, compressed to a file size of around 100 kb, but not to a degree which has had a detrimental impact on quality. A typical example can be seen here. When I was photographing these documents my goal was to take as many as I could in the time available, and as a result they are not perfectly framed, and a small few have defects; e.g. blurring due to a warped page in a file bound too tight, or missing words due to damaged or folded sheets which were not noticed at the time. On a rare occasion I discover that a page is missing, and some sections, largely concerning administrative policy, were deliberately omitted as they were not a priority at the time and I had limited space on my memory card. Also bear in mind that these are copies of the original documents; most of the pages are typed and very easy to read, but a good number have been handwritten and some of these are extremely difficult to decipher. If you would like to see a typical page from a specific diary, just let me know. In summary, this is a wonderful record, but it is neither perfect nor complete. If you would like to request a document, email pegasusarchive@googlemail.com and tell me which file(s) you are interested in and your preferred method of payment - cheque, BACS or Paypal via the Donate page. I will then confirm the fee and whether there are any apparent quality concerns within the document. Once payment has been received the files will be emailed to you in zip format, or memory stick posted first class for the entire collection. If you are interested in a war diary or other document which is not on this list and may not have any connection with the Airborne Forces at all, let me know and I will endeavour to acquire it for you. If you are able to wait for up to a year I will get it as part of my annual visit to the National Archives at a cost of £10 per small or medium document, and £20 for a large one, payable after collection. If you need it as soon as possible, I will require payment of £100 in advance to cover one day's travel and one document, thereafter the same costs as above per additional document. 1st British Airborne Corps, 1st Airborne Division, 6th Airborne Division, 44th (Indian) Airborne Division, 2nd Independent Parachute Brigade Group, Glider Pilot Regiment, Air Despatch Units, Associated Units - Arnhem, Associated Units - Normandy, Associated Units - Rhine Crossing, Miscellaneous.